Whoa, friends, it seems like August is my month to catch up on sharing some of the incredible, incredible styled shoots I've had the honor of participating in over the past few years. I know, I hang my head low as I say "few years", but at least I'm sharing and not keeping this beautifulness locked away on my computer. To be honest, I'm stoked to have so many features to share! I'm working hard here behind the scenes on a Sincerely, Jackie brand refresh, which involves finally shooting all of my new designs from 2016 and 2017 (yes, I am seriously behind). It's kind of awesome to have fun features to share while I gather new content. I can admit that, right? Good, because I did. Anyway, this shoot was dubbed "For The Love of Copper" and I think that name nails it. It combines all things beautiful, modern, and COPPER! I loved creating these never-before-seen Sincerely, Jackie invitations, and again, had so much fun playing with styles a little different from what I normally do. 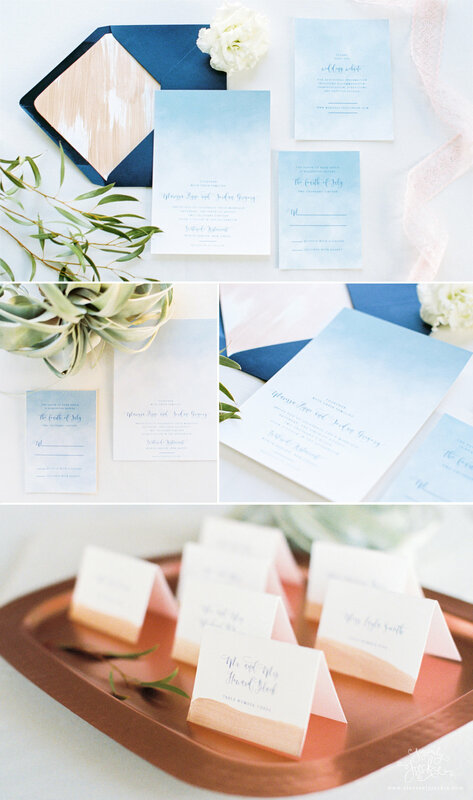 The invitations I created for this shoot combined watercolor, modern style calligraphy, and hand painted copper envelope liners. I don't get to be so hands-on all the time, and I LOVED doing it for this shoot! Brandi, of Alexis June Weddings, took the most gorgeous photos, and Kaitlin Agulto couldn't have pulled together a more gorgeous shoot. Just take a look! This shoot took place at the Waterside Restaurant in North Bergen, New Jersey. With a stunning view on New York City in the background, it's such a lovely venue for city lovers and view seekers alike. 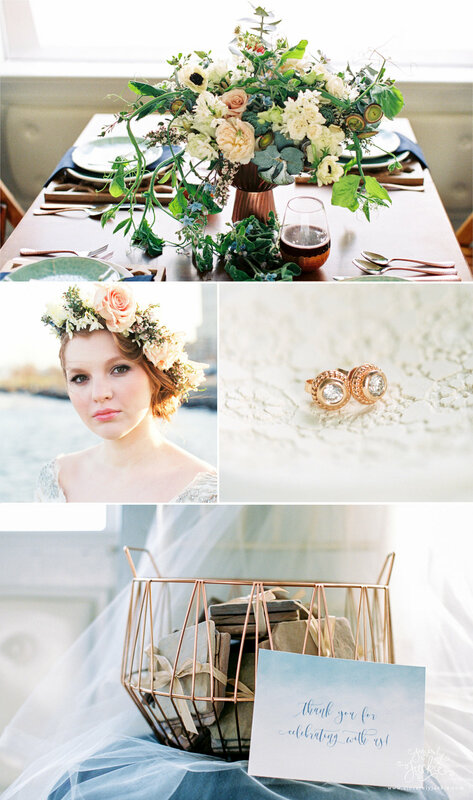 I loved the soft blues, copper, and touches of earthy greens - so fresh and romantic. The icing on the beautiful copper cake? This shoot was featured not once, but twice! First featured on Burnetts Boards, and then on Ruffled. Hooray!